Everyone’s heard of the famed “lions and tigers and bears, oh my” line in the movie The Wizard of Oz as they walked gingerly down the Yellow Brick Road. But what about “spiders and scorpions and snakes?” Could the movie have had it all wrong? Well, not to diminish the fears of Dorothy and her entourage, but it might’ve been more appropriate considering snakes and spiders rank among the public’s top five fears. Now, with spring approaching, many of those creatures we fear most will begin to emerge from a winter of inactivity. 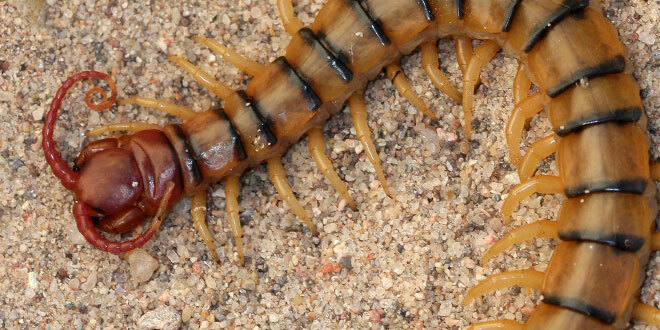 Above: While smaller centipedes generally can’t penetrate human skin, the bite from a large centipede can be dangerous to small children and cause pain, swelling and fever for an adult. Photo by Jim Stuart. 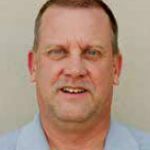 Regardless of when they become more active, Pierce said the best way to stay safe is to know where you are placing your hands and feet. “That simple rule will help people avoid the majority of potentially dangerous encounters,” he said. Of the snakes that reside in New Mexico, those that pose the biggest threat to humans will have a rattle at the end of the tail. Even newborns will have a non-functioning button on the end. “Simply put, there is no such thing as an ordinary rattlesnake bite,” Pierce said. “If bitten, forget everything you’ve ever seen in old movies about sucking out venom and certainly do not try to capture the rattlesnake. Identification is not necessary for treatment and you put yourself in a position to get bit again. He said that while most rattlesnake bites are quite painful, individuals should never use ice or a tourniquet. Those actions will restrict blood flow and allow venom to act aggressively at the site of the bite. About 30 percent of rattlesnake bites are considered dry bites, which does not mean no venom was injected, but that not enough was injected to require treatment. Rattlesnakes pose a most significant threat to humans in New Mexico and anyone bitten should immediately seek medical attention. 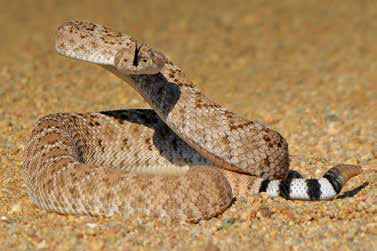 There are approximately nine rattlesnake species in New Mexico. The largest and most common of these pit vipers is the western diamondback. Among those is how aggressive specific species can be. But, as it relates to humans, there is no such thing as an aggressive rattlesnake. Pierce added that many people have different views on the most dangerous rattlesnake. “That’s easy,” he said, “the one that just bit you. But rattlers aren’t the only creature with fangs to deliver venom. All spiders are venomous, but that does not mean they all pose a threat to humans. The two factors that must exist for a spider to be considered dangerous to humans is whether its fangs are strong enough to break human skin and whether their venom is strong enough to do damage. With those factors in mind, the spiders considered dangerous to humans in New Mexico are the western black widow and several, but not all, species of brown spider. The “real” brown recluse may occur along the extreme eastern border of New Mexico and Texas, but does not occur statewide. 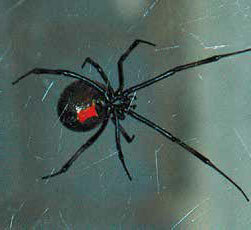 The black widow possesses a potent venom. Those experiencing an adverse reaction should consult a medical professional. Spider bites may feel like a pin prick and a person may not know they’ve been bitten and a reaction may not be seen for up to 36 hours. If a person is aware they’ve suffered a bite, wash the area with soap and water if it is available. “It’s important for people to know how their body is reacting. If they have any fears they should contact a health professional or their physician’s office for advice,” said Dr. Carol Sutherland, extension entomologist at New Mexico State University. Distant relatives to spiders are scorpions. Instead of fangs, a scorpion’s venom delivery system is through a fish-hook shaped stinger at the end of the tail. Most stings are considered a bit more painful than that of a bee. However, a sting from a bark scorpion can be more severe for a segment of the population. “The bark scorpion is the most dangerous scorpion in the United States,” Sutherland said. 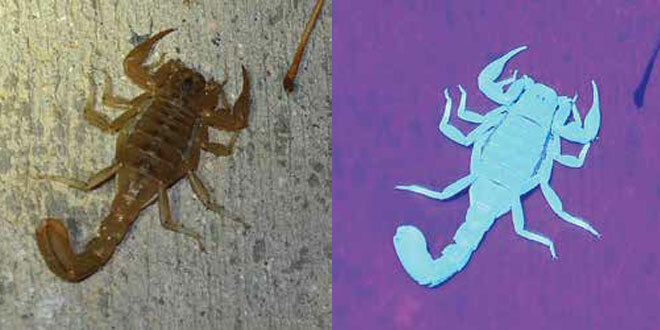 These scorpions are located primarily in the southcentral and southwestern parts of New Mexico. The sting of a scorpion, which glow in the dark under black light, is generally considered a bit more severe than that of a bee. Following a sting, if a person begins to slur their speech, develop a swollen tongue, drooling, respiratory problems, or difficulty in swallowing, contact a medical professional for advice. If stung on the hand, an individual should remove any jewelry immediately to avoid potential loss of circulation as a result of swelling. Some simple steps to avoid stings are wearing leather outdoor gloves when working around wood or rock piles and to shake out shoes that have been left outdoors. Also use caution when working around boxes, in storage sheds or barns, and around landscaping materials. Because scorpions can climb, when it comes to infants, the legs of a crib can be placed in a smooth glass jar (no ridges or paper). The only lizard considered dangerous to humans in the United States lives in southwestern New Mexico: the Gila monster. Bites from a state-endangered Gila monster are very rare. Leave them alone and they leave you alone. 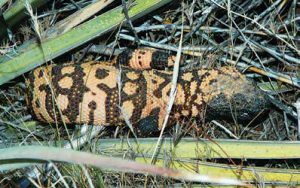 State-listed as endangered, this heavy-bodied lizard is protected and it is against the law to harass, disturb, or kill a Gila monster. Regardless of whether it is a spider, snake, scorpion or lizard, it is important to understand that no two bites or stings are created equal. Children are of particular concern to Dr. Carol Sutherland, extension entomologist at New Mexico State University. She said their natural curiosity can place them in harm’s way. Sutherland said it is important to begin educating children at a young age and to continually reinforce the message. Pets are certainly susceptible to bites and stings, but the primary concern is with rattlesnakes. For those concerned about the potential for a housecat to be bitten, the only true solution is to keep them indoors, where they should be anyway. Dogs, like children, are quite curious. As a result, many of dogs are bitten each year and a rattlesnake bite can be costly, fatal, or both. Pierce said those concerned can contact local veterinary offices to inquire about snake avoidance classes that may be available and pre-bite vaccines. However, if bitten, anti-venom treatment at a local veterinary clinic is still advised. Well, there you have it. Whether Dorothy had it right or not is up to you to decide.